The contemporary Geysir Concealed Thermostatic Valve with 3 way diverter from Tre Mercati will compliment any modern bathroom suite, offers thermostatic showering via two easy-to-operate controls for temperature and flow. Shower valve is covered by a 10 Year Guarantee from Tre Mercati against any manufacturing defects.Operates two shower accessories separately or simultaneously: fixed head & slide rail kit, fixed head & body jets or slide rail kit & body jets. Bring a bit of italian flair to your bathroom! Q. What are the measurements of the chrome plate? 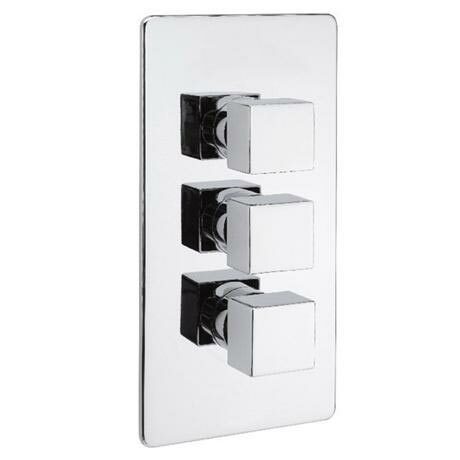 Hi, the dimensions of the Tre Mercati Geysir Shower Valve back plate are 150W x 320H mm. Hope this helps.